***UPDATE SEP 2015*** A SECOND TAPE! Mr PorkPie Man: a tape I found in a charity shop in Preston, Lancashire, in June 2000. I often look in charity shops for second-hand records by bands I like and sometimes I find something I want. On this occasion, I found this instead. The best one pound fifty I ever spent - well that week anyway! I couldn't find anything about this strange superhero on the internet, so here is the first and probably only webpage devoted to him. Sleeve notes: The only information I have about this tape is what is printed on the inlay card. Pork Pie Man tour received positively and enthusiastically with a dynamic figure who enhanced Pork Pie proposition. 1,000 questionnaire responses were received. 40,000 consumers sampled pork pies. 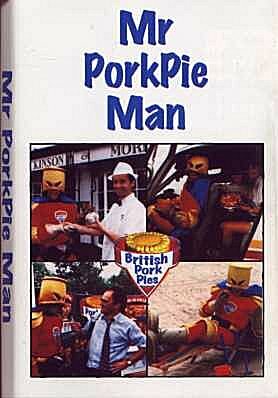 250,000 saw Pork Pie Man in person. Over 3,000,000 read or heard about Pork Pies in the pre-arranged regional newspaper and radio coverage alone. The inspiration for the Pork Pie song. With thanks to: David A.Hall Ltd. of West Lothian; Walker and Son Limited of Leicester; McIntosh of Dyce in Dyce, Aberdeen; Pork Farms Bowyers of Nottingham; Geo. Adams Ltd. of Spalding, Lincolnshire; Kerry Foods of Egham Surrey. There, now you know as much as I do. I intend to write to British Meat Information - if I get a reply, I'll post it here. The Cover: Let's get a better look at those pictures on the front. This man was seen by 250,000 people! If you were one of them, please tell me about it. Lyrics: Oh these are good! And right now folks, they got their own super hero! The Music! I bet by now you're dying to know what it sounds like, aren't you? It sounds like it was made somewhere around 1990, being in the rap/pop style that was popular in the British charts at the time. But the 0171 dialling code given in the notes wasn't introduced until 1992 (I think?) so I suppose that was when it was probably made. Feedback: Did you see a strange man dressed as Superman dressed as a pork pie in the early nineties? Do you also own a copy of this fine single? Did you eat a pork pie once that made you ill? Tell me all about it. British Meat (link no longer valid by 2015) - alas, no mention of our hero here. P.S. I don't like pork pies. I can't stand cold meat. Well, I couldn't be arsed to write to British Meat Information in the end. I put the page and the MP3 up to show some friends who were curious about this pork pie tape I was blithering on about, then pretty much forgot about it for four years. However, someone has finally sent in some useful information! Mr. Winston Lucas of Halifax has sent me this link (link no longer valid by 2015). Scroll down a little bit and we find that our hero is named Stuart Booth and is still up to his porky antics, recently hosting the 2004 Ripponden Pork Pie Competition. Alas, no information on whether he will be reviving his pop career any time soon. And now it seems Mr Pork Pie Man has got married. He didn't the wear the pork pie suit for the ceremony - but the reception did feature an unique non-kosher wedding cake! Thanks to Mr. Tony Jenkins of Cardiff for this info. Wow! I was just curious about a couple of songs that I WROTE (around 1995) for the 'British Meat and Livestock Commission' and holy mackerel, there's a web-page dedicated to ME! I was the actor in the suit (not James Booth or whatever the name), I had just finished working at Chessington World of Adventures for 12 weeks to get my Equity Card, and was approached by the BMLC to be their Super Hero. My first gig was a trip to Paris on the Euro Star and have some photo's taken next to the Eiffel Tower. 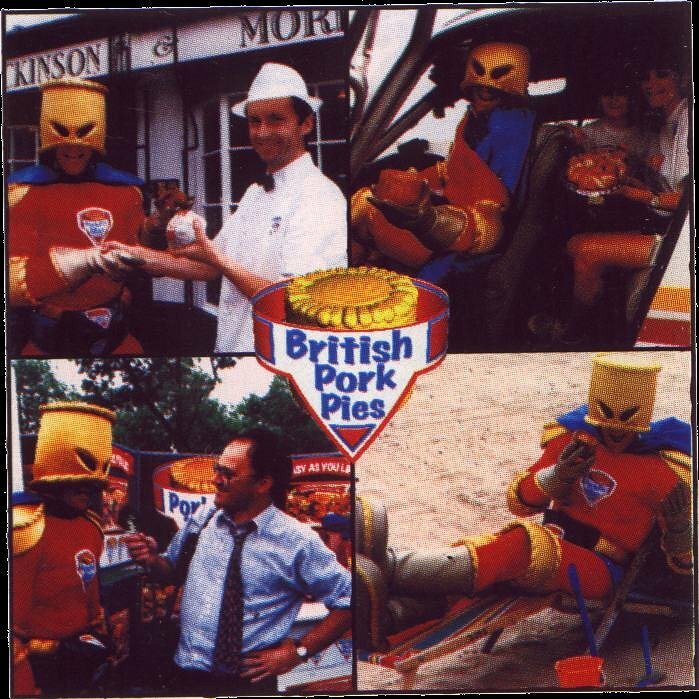 We did a tour of the UK promoting pork pies and when they discovered that I could write songs (had been singing in bands for a number of years and writing all my own material) they asked me to write a song about Pork Pies. They loved it so much that I was then asked to write a song about Sausages (which I think is an even cooler song) The girl doing backing was a friend of mine her name is Caroldene and you might find info on her if you google her name. I worked for the BMLC for about a year and then moved on to do some serious acting. I now live in New Zealand and have been here 5 years and still sing, perform and act and also do puppet shows (take a look at my website http://www.storywithrory.co.nz/ Rory is my sidekick a little bear) You might like to contact the British Sausage Appreciation Society and see if they have any info on the song 'It's a Sausage', if not I will make you a copy and post it onto you. It was great fun playing the super hero and travelling all over the UK, and at dinner parties friends would love to hear 'Mr Pork Pie Man' and 'It's a Sausage'. I hope this is useful, and thanks for showing an interest in my song, I haven't heard it played for a while now. Well that certainly clears up that mystery but wait...what? A SONG ABOUT SAUSAGES?! I have contacted the British Sausage Appreciation Society (link yet again no longer valid by 2015) but have yet to receive a reply. OK then people, let's try to track this one down - bonus points if we do it before 2026! Yes, glad tidings and let the bells rings Hosannah, for the above mentioned Mr Garry Snape a.k.a. Mr PorkPie Man himself, hath in his great benevolence sent unto me a SECOND TAPE! 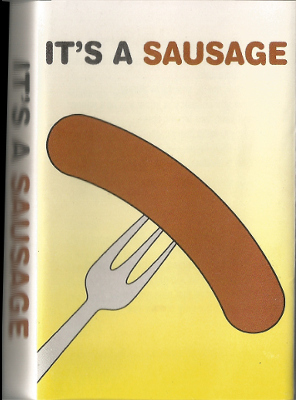 A tape about sausages! So without further borderline blasphemy, here is the lowdown on this lost masterwork, which I have again presented in the same rubbish done-on-windows-notepad design aesthetic which looked outdated and inept even back in the year 2000. The Cover: Well this is the first thing that greets us and if I'm honest it's not as attention grabbing as the Mr PorkPie Man art. I don't think I would have bought this if I'd seen it in a charity shop, which would obviously have been a mistake. However for people of a certain age, it may bring to mind flashbacks of early Grange Hill episodes. Sleeve Notes: Again, a lot more sparse than the other tape. Hmmm, where have I seen that address before? Lyrics: Now things get interesting! Wake up, wake up, wake up, wake up, repeat. a word that's been around since who knows when. you can't beat the taste of a sausage. what ever you choose you know you're a winner. what ever you serve though, you know there's no waste. give them a sausage and you're heaven sent. the sausage is the only one for me. The Music! Fifteen years of gruelling work updating this page twice a decade or so has been amply rewarded. This song has won my heart and instantly become one of my top two favourite songs about meat products. Feast your ears! The B-sides! To my great surprise and excitement when I first played this tape, once the music had finished, another song started up! It soon became disappointingly apparent however, that it was just an instrumental version of the first track. I mean it's not a bad tune but it's nothing without the lyrics. Once that track had finished, the instumental bizarrely seemed to start up again but then I noticed that this one had backing vocals included. Which means that we have a Karaoke version of It's A Sausage! Now the inclusion of this seemed somewhat optimistic to me but then I remembered that the man himself told me that this tape was just used for performances which probably means that it was for him to sing along to at live appearances, rather than with the thought that some young wannabe popstars would be crooning into their hairbrushes along to it in front of their mirrors. But if you want to do just that, I have included the extra tracks below. It's a shame there wasn't a vocal only version, opening up a greater possibility for remixes. Unless anyone does send in any remixes or Mr PorkPie Man releases his autobiography, that probably ties up all the loose ends now. I hope you enjoyed the meaty music!